The New York Times bestselling and beloved Caps for Sale series by renowned illustrator Esphyr Slobodkina continues with the all-new release, Caps for Sale and the Mindful Monkeys! Following More Caps for Sale, this funny and thoughtful read-aloud is inspired by The Elves and the Shoemaker. Here, the monkeys prove to the peddler that while they may be mischievous, they can also be very helpful. Those playful monkeys who wore the peddler’s wares in Caps for Sale just won’t leave him alone. As he walks through the streets selling his caps, the monkeys follow behind him, and as he walks back home at the end of the day, they trail along too. All in step. The peddler is tired of their trouble, but when he asks his friend Essie for advice, she thinks he should give them one more chance before deciding they’re no good. 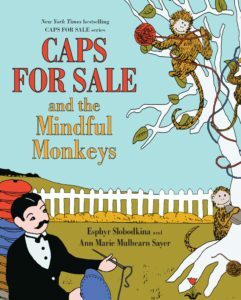 So when the peddler must go out of town to attend to a sick friend, the monkeys have a surprise in store for his return, showing that they might just be more mindful than they appear. A book signing and story presentation will take place on Saturday, October 21, 2017, from 2-4:30 p.m. at Rizzoli Bookstore in Manhattan.